So you’ve probably seen the Reclaim the Power camp and day of action in the mainstream (corporate) media. We got a lot of coverage, from the Daily Mail shrieking about “mob rule” to the BBC calmly showing footage of police violence with little comment from the presenter, to the Independent weighing up the facts and coming down firmly against fracking. We were covered by every major UK news outlet and dozens of smaller, more specialist and international ones, from Al Jazeera to PR Week. From this perspective, even the most sneering or dismissive piece of mainstream coverage may actually be helpful to the cause. Francis Maude’s office on the Day of Action. Photo by No Dash For Gas. Another important thing that all the corporate media reports had in common is that none of them truly captured the spirit of the camps or the day of action. For that, we need to turn to our own media – the blogs, films, photos and recordings from participants in Reclaim the Power and the community protection camp, and the independent, grassroots news outlets who actually took the time to find out what was going on in Balcombe and why. If you really want to know what happened in Balcombe last week, then here’s a compilation of the real coverage that we’ve found so far. If you’ve spotted anything that isn’t included here, please email us on press@nodashforgas.org.uk and we’ll add it to the list! What Price? from You and I Films on Vimeo. You should also check out this excellent broadcast by Resonance FM, which begins with a tour of the Reclaim the Power camp, delivered by one of the younger participants. Plus this special radio broadcast from Grassroots Takeover. There’s also a Storify that summarises the week through a series of pictures, films and social media messages. The Reclaim the Power Flickr stream has some nice photos. Melanie Strickland from Occupy London calls the camp “a hugely empowering experience”. Hamza Hamouchene, an Algerian human rights activist, gives an international perspective on the camp. Ruth London from Fuel Poverty Action, on this very webpage, debunks the myth that fracking will bring down gas bills. Pete the Temp had a strangely life-affirming experience when he played a game of Thumb War with a Gurkha through Cuadrilla’s fence. One of the six women who superglued themselves to Cuadrilla’s PR company gives her account of the action. Scriptonite Daily dissects the negative environmental, social and economic consequences of fracking and the dash for gas. The Network for Police Monitoring explains how the policing at Balcombe broke the police’s own guidelines for responding to protest. Two people from No Dash For Gas explain the issues on the Left Foot Forward blog. Campaign Against Climate Change give a two-part report: Part 1 and Part 2. There’s an Indymedia report from the camp here. Ed Bauer sums things up for the Anticapitalist Initiative site. A World To Win presents some great photos and interviews from the camps. There are some nice photo reports from both Red Pepper and Demotix. 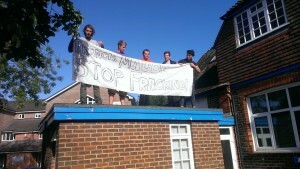 Residents of Southwark visited the camp and have written about their concerns about potential fracking in their area. UK Youth Climate Coalition have written a thoughtful piece about their experiences and the issue of intergenerational justice. Please let us know if there’s any other good grassroots coverage that we’ve missed!